Traditional Spanish food is influenced by the Greek, Roman, Phoenician and Moorish settlements over the centuries. With the immense variety of Spanish food recipes, there is enough to satisfy every one. And Merluza a la romana (battered fried hake) is popular dish Argentina that just happens to be of Spanish origin and it one of the various minutas served daily through out the country. What are minutas, you ask? Well, think of them as Argentinian “fast food”. They are a reliable set of dishes that are simple, popular, quick-to-prepare. These short-order dishes are served as a sit-down meal, with china plates and waiter service and often available at all hours. The tradition of minutas was invented to offer standard, affordable fare to working men. Siesta culture may be long dead in Buenos Aires, but, to this day, many workers still take the time out in the middle of the day to go to their local cafés for a hot meal, even on stiflingly humid summer days. For this recipe, hake was not available in my neck of the woods, but I was able to find barramundi or Asian sea bass. Barramundi have a mild flavor and a white, flaky flesh, with varying amount of body fat. In the U.S., barramundi is growing in popularity. Monterey Bay Aquarium has deemed U. S. and Vietnam-raised barramundi as “Best Choice” under the Seafood Watch sustainability program. 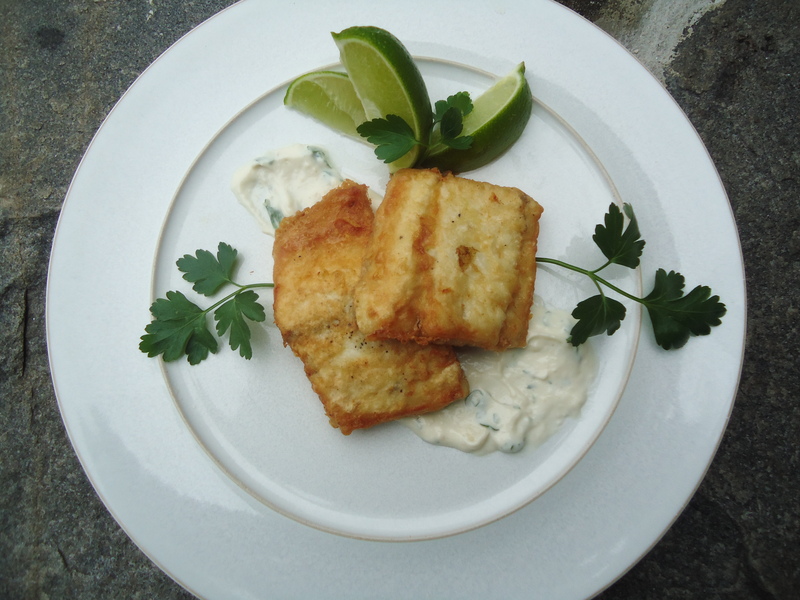 If you are unable to find hake, another white firm-fleshed fish such as cod or haddock can be used in this recipe as great substitutions. For the mayonnaise, combine the egg yolk only and mustard in a bowl and whisk until well mixed. Gradually whisk in the oil, a little at a time, until completely incorporated and the mayonnaise is thick and silky smooth. Note: When the whisk is lifted, the mayonnaise should hang off but not fall. Whisk in the lime juice and add the horseradish, garlic and parsley. Season with salt and pepper to taste. For the fish, pour about an ½ inch of olive oil into a large cast iron skillet, placed over a medium heat. In a shallow dish, lightly beat the eggs. Pat the fish with paper towel to remove excess moisture.Season both sides of fish with salt and pepper, to taste. Dredge each piece of fish flour, shaking off the excess and then coat well in the beaten egg. Place into the hot oil and fry for about four minutes on each site, depending on the thickness of the fish, until golden-brown. Remove the fish from the oil an drain on a paper towel lined platter. To serve, take 1 tablespoon of the mayonnaise and streak the center of the serving plate with the back of a spoon. Place the fish on top and garnish with lime wedges. This entry was posted in Main Dish, Seafood, South American and tagged Argentina, Fried Fish, Limes, Mayonnaise. Bookmark the permalink.